The system of collecting end-of-life vehicles (ELV) was successfully established; however, it has not reached all the set objectives and the anticipated quantities of collected and destructed vehicles. By awarding 5-year concessions for performing public utility service of the management of end-of-life vehicles in 2007, proper inclusion of car scrapyards into the system of decommissioning, intensified surveillance of illegal disposals and export, and particularly disabling the abuse of declarations indicating the location (temporary deregistration of vehicles) and by informing the public, we must enable the recovery of the planned quantities of end-of-life vehicles. 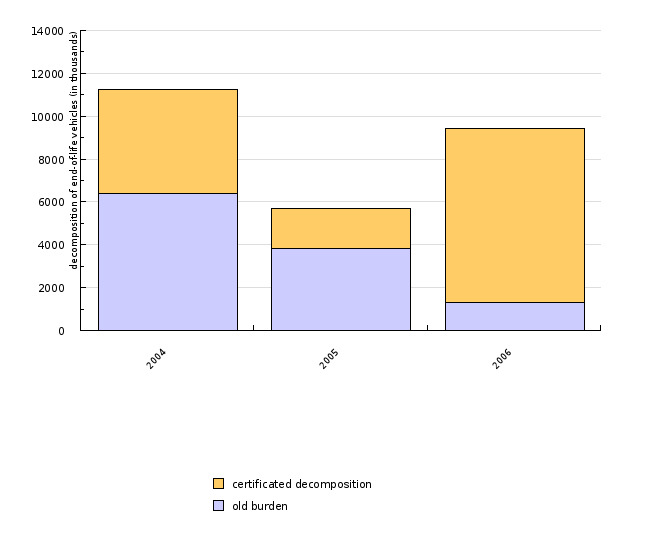 The indicator shows the quantities of end-of-life vehicles within the framework of the decommissioning system in authorised recovery centres, and the success in reaching the target percentages of reuse, recovery and recycling of end-of-life vehicles. An end-of life vehicle is an unusable or discarded vehicle that has reached the end of the road by way of its age, collision write-off or other reasons, and has become waste material according to the regulation governing waste management (Rules on the management of end-of-life motor vehicles, Official Gazette of the Republic of Slovenia, no. 118/2004). - To ensure a unified system of collecting end-of-life vehicles on the entire territory of the Republic of Slovenia and 100% recovery of end-of-life vehicles. - To reach the percentages of reuse, recovery and recycling (85% by the end of 2006 and 95% by the end of 2014) and eliminate old burdens. - Proper treatment of hazardous substances. In the Republic of Slovenia, the number of newly registered private vehicles has increased up to around 100,000 in the past years. The trend of increase of registered private vehicles is similar; from around 400,000 in the middle of the 1990s, the number has grown to more than 1,000,000 in the last years. In 2005, around 10 million tonnes of waste from end-of-life vehicles were produced in Europe. This waste qualifies as hazardous waste due to the substances it contains. The rules on the management of end-of-life vehicles with the purpose of reducing the quantity of discarded vehicles by means of reuse, recycling and other forms of recovery are determined by the Decree on the manner, subject of and conditions for performing public utility service of the management of end-of-life vehicles (Official Gazette of the Republic of Slovenia, nos. 18/2003, 135/2003, 32/2004, 18/03, 135/03, 106/05, 32/06, 57/06 and 106/06) and the Rules on the management of end-of-life motor vehicles (Official Gazette of the Republic of Slovenia, no. 118/2004). The system of management of end-of-life vehicles is ensured within the framework of the implementation of public service obligation. One of the essential measures for the operation of this system is the introduction of the “certificate of destruction”. The last owner of the vehicle that qualifies as an end-of-life vehicle according to the environmental protection rules and the rules on the management of end-of-life vehicles must submit the certificate of destruction upon deregistration of the vehicle. The producers’ liability for decommissioning has also been introduced. Since 1st January 2004, the funds allocated to the implementation of public service obligation are guaranteed from the funds collected from environmental taxes, which are paid by the manufacturers, acquirers, and importers of vehicles, and natural persons who import a vehicle into the territory of the Republic of Slovenia. End-of-life vehicles are collected at collection points in four concession areas. From there, they are transported to treatment centres where they are dried and disassembled. The recollected hazardous substances and materials are then reused, recycled or recovered. In the period between May 1, 2004, when the system of performing public utility service of the management of end-of-life vehicle became operative, and the end of 2006, four temporary contractors performed this public utility service. In this period, the system did not recover the planned quantities; most of the recovered end-of-life vehicles were collected as so-called “old burdens” (i.e. end-of-life vehicles collected by local communities as abandoned vehicles whose last owner was not identifiable). In 2005, when the obligation of paying the cost of decommissioning of end-of-life vehicles put on the market before 2002 was transferred to the last owner, the quantity of end-of-life vehicles in the system deteriorated. The method of temporary deregistration of end-of-life vehicles by means of declaration of the location of the vehicle began to be abused. Another reason for fewer recoveries were illegal disposals and illegal scrapyards. Owing to these circumstances, intensified surveillance began and scrapyards were gradually integrated into the recovery system. The essential measure that increased the number of vehicles collected for recovery was the elimination of the last owners’ payment liability for disassembly in December 2005. This resulted in a significant increase of end-of-life vehicles delivered for disassembly by the last owners. Between May 2004 and end of 2006, almost 10,000 tonnes of end-of-life vehicles were dried and disassembled in recovery centres, and by the end of 2006, 16,000 tonnes of materials and supplies were collected from disassembly for the purpose of reuse, recycling and recovery. According to initial estimates of the system’s operation, 85% of reuse, recycling and recovery is a realisable goal. a) Category M1: Vehicles used for the carriage of passengers and comprising no more than eight seats in addition to the driver's seat. b) Category N1: Vehicles used for the carriage of goods and having a maximum mass not exceeding 3.5 tonnes. c) Category L5: Vehicles with 3 wheels symmetrically arranged in relation to the longitudinal median axis, with a ‘Gross Vehicle Mass‘ not exceeding 1.0 tonne and either an engine cylinder capacity exceeding 50 ml or a ‘Maximum Motor cycle Speed‘ exceeding 50 km/h.